Since then, a feature known as Windows Containers was made available for Windows 10 and Windows Server 2016. There are two types of Windows Containers: Windows Server Containers and Hyper-V Isolation. The former provides application isolation through process and namespace isolation technology. A Windows Server Container shares a kernel with the container host and all containers running on the host. The latter expands on the isolation provided by Windows Server Containers by running each container in a highly optimized virtual machine. 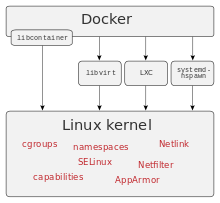 In this configuration, the kernel of the container host is not shared with other containers on the same host. The guest OS image is a Windows Nano Server image, which is 652 MB in size and has the same limitations of Nano Server, as well as a separate end-user license agreement. ^ "Docker Releases". GitHub. Docker, Inc. April 11, 2019. Retrieved April 23, 2019. ^ "Docker frequently asked questions (FAQ)". March 2, 2019. ^ Dan Walsh (September 15, 2014). "Yet Another Reason Containers Don't Contain: Kernel Keyrings". projectatomic.io. Retrieved April 13, 2015. ^ "Work with notifications". March 2, 2019. Cite error: A list-defined reference named "windows-containers" is not used in the content (see the help page). This page was last edited on 23 April 2019, at 19:25 (UTC).